Bartomeu Mari, director of the National Museum of Modern and Contemporary Art, Korea, says areas of fine arts will crossover into the areas of design and architecture. 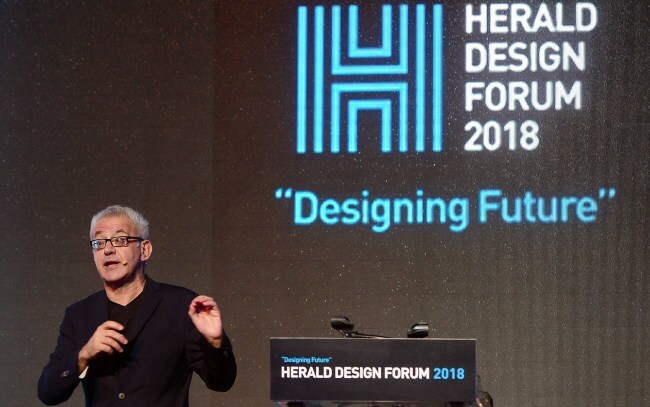 During his lecture at the second day of Herald Design Forum 2018, held at Dongdaemun Design Plaza in Seoul, Saturday, Mari said design had expanded its boundaries and broken the monopoly that fine arts had occupied for a long time. The museum space will be inclined more and more towards design and architecture, when preparing exhibitions, Mari pointed out. To make the museum space more physically interactive, museums will make more extensive uses of architecture and design. The future role of fine arts and design is not a conclusive one, he added. “We need to keep thinking and debating about everything that surrounds us, as well as the ways in which we live within it,” Mari said. Mari also introduced MMCA’s four branches, mainly their historical and geographical backgrounds. “In my opinion, Korea has a great opportunity to tell another story of art that is unique,” said Mari when asked how Korean art can appeal to art scenes outside the country, explaining that Korea‘s traditional craft works, for example, carry a unique quality of Korean art. According to Mari, traditional crafts in Korea have a function, theoretically, but that they are not necessarily used for that function. Their main function is the pleasure of visual contemplation of them, like art, Mari said.